Father James joined the priesthood after the loss of his wife. He is a good man who has done no wrong since joining the clergy. As a result of his blameless life, a man confesses that he is going to kill Father James in one week as a sacrifice for the priest who molested him as a child. CALVARY brings together two elements that have always shaped me: faith and cinema. I don't talk a lot about my faith in my reviews, nor do I watch a lot of Christian centered films. But, if I'm being honest, my faith is usually the first thing through which I filter a movie and if I find that a particular work has a strong spiritual message/tone to it I am willing to overlook a lot of inconsistencies (I'm looking at you, As Above, So Below) and CALVARY is a film that illustrates just that. From the set-up, CALVARY is clearly a reinterpretation of the story of Christ and as such works fairly well. Father James has one week to carry out the rest of his life and watching him wake-up each morning knowing the fate that awaits him is very compelling. It's a lot of what fills the time between his waking breath and his bed time that falls flat. Vignette-driven narrative is an incredibly hard form of filmmaking to pull-off since vignettes are inherently anti-narrative. Writer/director Joh Michael McDonagh is able to thread enough narrative silk through the vignettes to make it all make sense but he does so with such little panache that it can be a little tedious. Brendan Gleeson's portrayal of father James is either comatosely understated or thunderously over the top. When these elements combine the film seems to meander a lot and not really have much to say about the over reaching thematic narrative that ties the first and last scenes of the film together. That is honestly the biggest problem with CALVARY. It could have been a short film but instead it feels like a short film that was stretched to feature length for no real reason. Sure, when Father James dies there is a great payoff montage of all the folks he has interacted with over the last week quietly reflecting on just how much of an impact he had on their lives and just how much they mistook his dutiful shepherding as lonely priest prying for gossip, but all of that still could have been accomplished in about half the time it actually takes. A good bit of the side characters are very odd and do not really seem to fit into the somber mood created by the washed out color palette and sparse score used throughout the film. A lot of them range from out of place to downright cringeworthy in their over the top portrayals. A doctor who is not only an atheist, but someone who seems to revel in the depravity that can be trespassed by the human soul and a gay prostitute who seems to be a mainstay of the former police chief's bedroom fare the worst, but a handful of others really broke my immersion (now is also a good time to mention the film isn't exactly squeaky-clean or family friendly). Structurally speaking CALVARY is all over the place. However, when it comes down to thematic heft, the film shines. 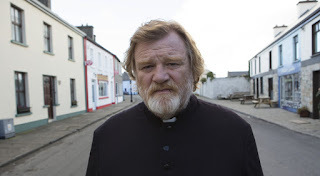 The meat and potatoes of CALVARY lie strictly in the Father James as Christ theme which gives the film plenty to draw from. We see the father's relationship with his daughter parallels that of Christ's with his disciples. His care for an abused woman reflects Mary Magdalene, etc. It's in these parallels that the true purpose of the film comes to light. It is a loose retelling of the gospel that ends with the beginning of the book of Acts. It's in those thematic bits that I actually became endeared to the film. Father James dies and his daughter then has to take her father's integrity, faith, and story to the rest of the world; starting with the very man who killed her father. That's when the credits begin to roll (I refuse to apologize for the spoiler because, let's face it, you're not going to watch this movie) and my mind went absolutely WILD at the story that followed. Not in the sense that I wanted a sequel, that would be silly, but in the sense that I knew Father James' legacy would live on. I am fascinated by the nature of faith and cinema simply because most of the story types we tell can be found in scripture and creators tend to unconsciously chew those familiar stories up and spit them out in surprising ways. I think we are starting to see that take shape in our mainstream movies as well. THE AVENGERS: AGE OF ULTRON, BATMAN V SUPERMAN: DAWN OF JUSTICE, and X-MEN APOCALYPSE all have pretty overt spiritual themes to them. I would argue that the filmmakers seemed to be too afraid to explore those ideas as fully as I may have liked so as not to offend folks, but the building blocks of a spiritual arc are there. CALVARY, for all its shortcomings, delivers a spiritually thematic story in an unconventional and risky way which endeared me to it and ultimately made me come out on the side of liking the finished product even though it seemed a bit overwrought at times.